Hi everyone! 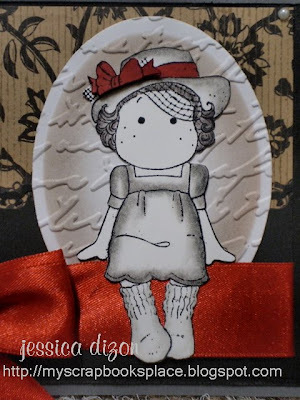 Today's card is my entry for Magnolia Down Under Challenge #41 (and my entry to Featured Stamper 166, too!). MDUC had set a theme which is "Olden Days". We are to colour Tilda in black, white and greys and the papers to be used are either colourful or with vintage look. My Tilda was coloured with black and different degrees of "greys" from my Prismacolor pencils. I didn't have any problem colouring her skin as she's already white and she has to be black and white. LOL!! Yeah, she should be black and white but I can't help myself so I coloured the bow on her hat with red. I stamped it twice and popped up the 2nd one for dimension. The bow is the only one coloured with Copic marker (Lipstick Red). ETA: I'm also entering this card to Our Creative Corner Challenge - Bows! Perfect timing! I finished off the card with some Kaiser pearls and a red bow made by Bow Easy!! Honestly, I'm not into ribbons before. In fact, I have lots of satin ribbons being hoarded and were never used but not until Bow Easy was introduced to me - I was given a whole new perspective about ribbons!! LOL!!! Thanks for looking and for your lovely comments. I really, really appreciate it. omg .. this is one of my faves to date .. ( i already have a couple of faves in ur collection) but this is amazing !!! classy but not boring . gorgeous ! This is gorgeous and so vintage and shabby. You really did nail the challenge on the head with this card! Thanks so much for joining MDUC this week. gorgeous job Jhet! this looks AWESOME!! Love it!! That big red bow is fabulous, I might have to get one of those bow easy thingys, my bows never look that good! Love your colouring, it's a fabulous contrast to the red. Thanks for playing along with us this week at MDUC!! oh WOW STUNNING!!! The colours jump out and almost grab you!! Thank you for joining us at Magnolia Down Under! You've colored Tilda so beautifully, and her red bow is a lovely touch! The red bow you made is so gorgeous! 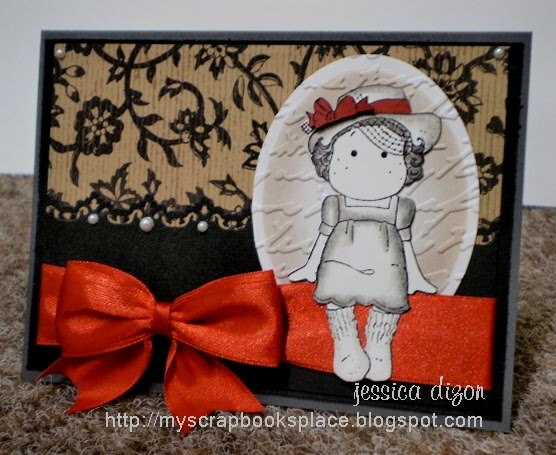 I love the embossing, papers and punched detail--a beautiful card! Thank you for joining us at Magnolia Down Under! Wow that Tilda is soooo perfect for this theme, she looks fantastic :oD I love the papers that you have used and the touch of red. Just gorgeous!!! I love how the ribbons are so bright and bold. Gorgeous card!